The ‘Reader’s Digest’ used to have a regular slot for ‘The Most Unforgettable Character I’ve Met’ and all sorts of people were included in the series. My own subject would have been, without much if any doubt, Doctor IMM Macphail. He was our history teacher at Clydebank High School but much more than that. 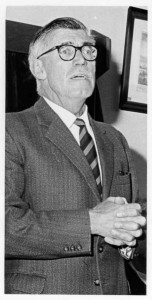 He was also the mainstay of Dumbarton AAC for many, many years to the extent that at one point they were referred to in jest as Macphail’s Navy (a variation of the TV programme McHale’s Navy). A conscientious objector during the War he volunteered for the bomb disposal squad and that’s how he spent his War. Before going on to talk about his time with Dumbarton AAC, I’ll quote from the flyleaf of his book ‘The Crofters’ War’. “With the publication of ‘The Crofters’ War’, Dr IMM MacPhail crowns a long and distinguished career. An eminent historian, teacher, genealogist, mountaineer and athlete, he has made his mark in many areas of Scottish life. It is however as a Scottish historian that he is best known: his two-volume History of Scotland for Schools, published in 1954 and 1956, and welcomed as ‘the book that Scottish schools have been waiting for’ is generally regarded as the history which first brought to the attention of a wider public an adequate treatment of the clearances and to the history of the Highlands and Islands. Other publications by Dr MacPhail include ‘Modern Times 1880 – 1955’, published in 1961, ‘Modern Scots’ (1965), ‘An Introduction to the British Constitution’ (1967) and ‘The Clydebank Blitz’ (1974). Books and articles on the history of Dumbarton where he lives, and its surrounding countryside, have greatly enhanced the knowledge of that part of Scotland. He has also been an assiduous contributor to the ‘Transactions of the Gaelic Society of Inverness’ of which he is a past Chief. 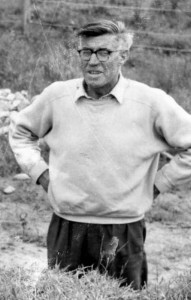 An expert linguist, his knowledge of and love for the Gaelic language came from his Lewis parents, and was strengthened by the links with the island he has cherished all his life. Add in his sporting interests of running, rowing, hill walking and mountaineering and you have a very full life indeed. His full name was Iain Murdoch Macleod MacPhail and his father was in the Army and moved around a lot with Dr MacPhail being born in Hamilton but was and is known as a real enthusiast for the Town of Dumbarton about which he wrote many, many books and articles. As a genealogist he was very interested in his own roots which were in the Outer Hebrides: The MacPhails from either Harris or North Uist and the Macleods from Shawbost in Lewis but the strange thing is that he did not have any historical connection with Dumbarton at all. Be that as it may, after his death the Lennox Heritage Society had a stained glass window to his memory installed in the Dumbarton Library. Iain MacPhail joined Dumbarton AAC in season 1930/31 and paid his first subscription of 2/- on 8th May 1931. Actually it was a half-subscription, full sub being 4/- because there was less than half the season left. His address was given as Carman Hill in the Renton and his brother William was also a member. On 5th December 1931 he competed in the club 5 miles Handicap where, with a handicap time of 2:30 he finished thirteenth of eighteen runners – the handicap was probably a ‘novice mark’ of 30 seconds a mile and it is the first record of him taking part in a race at the club. A year later, off 3 minutes, he was fourteenth of seventeen but it was a better run – the year before he was tenth fastest scratch time, this time he was fifth quickest over the course. By 1933 his handicap allowance was 3:30 and he was fifteenth out of twenty with the eleventh time overall. It is clear that even early on he was not going to be a star athlete but he was persistent and took part in races over the country and on the road He disappeared from the racing scene for a while but he was back again after the war and competing in club races but he soon became the regular handicapper and time-keeper. His post-race remarks must have been interesting for instance at the club presentation in March, 1959, the note in the race book said, “The Prize Presentation was held in the gym at the Brock Baths. Club President was in the chair. After speaking on current affairs, he asked Baths Superintendent J Donaldson to present the prizes.” But he will be best remembered as President and Chairman of the club for almost quarter of a century. He held no official post on the Committee before the War but was part of a small committee of four who were tasked with organising the first post-war races. His first official position was that of President. Doctor MacPhail became President of Dumbarton AAC at the AGM of 3rd September 1946 when the minute read, “Mr IMM MacPhail was nominated to the position of President on the motion of Mr Geo Stewart, seconded by H Smyth.” Further down the list of elected members was a note that he, along with Jack Brown, was nominated as one of the club’s representatives o the NCCU (the National Cross Country Union) The nominees to the latter post were not always nominated n the minute of the AGM but he was still a rep in the 1960s. A note: He might have been Doctor MacPhail to the world at large but he was Mr McPhail to the club and appeared as such all the time he was on the Committee. He stayed in the role for 23 years and resigned at the AGM of 28th August 1969. The minute of the meeting read “Next came the news which we were all sorry to hear. After 23 years a President of the club he had decided to call it a day, so that he could devote more time to one of his other interests in life, namely the writing of books and, as he would be away for long periods at times, he had very reluctantly decided to give up the chairmanship of the club which he had held since 1946. In doing so, he wished DAAC every success in the future.” He was however prevailed upon to remain as a member of General Committee but his attendances were not as regular as heretofore. What kind of President was he? He was one of the most active of Presidents imaginable. If look at some of the references in the club minutes during the middle years of his presidency we get the following. 16th September 1956: Mr MacPhail suggested that a special effort should be made when negotiating fences, etc so that no damage would be caused to the wire or to the gates. Messrs MacPhail and McMenamin were asked to revise the constitution. 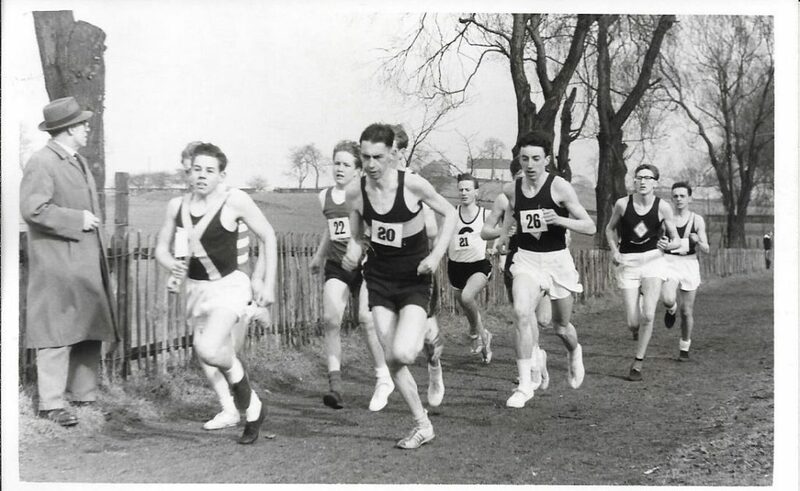 12/1/57: Messrs Timmins, MacPhail and Walker were asked to recce a trail for the club 8 miles championships. 23/3/57: Prizes for the club championships: It was agreed by the committee that an additional £3 be spent on prizes, thus bringing the total up to £12. Once again our very generous donors, Messrs MacPhail and McMenamin, intimated that they would provide the prizes for the hill race. Doc MacPhail was also asked to write to Dumbarton FC to ask for the same training facilities to be granted as last year. 28/8/57: Mr MacPhail said that he would draw up a list of fixtures for the committee’s approval. 15/1/58: There were not enough members to fill a bus to Hamilton and he was asked to contact the Vale of Leven about sharing a bus. 19/2/58: No one had asked the Baths Superintendant or a representative from Vale of Leven to the club presentation and Mr MacPhail said he would attend to this. 28/8/58: AGM. There was a complaint about the cost of race entries when some of the runners did not turn up or even know they had been entered. The chairman’explained’ that this was probably true but in most cases it was unavoidable as there were runners in the forces who always hoped to get home for these events, then there were the members who did not come along on club nights and they were not always available to ask. Then “the money spent on the track did not justify itself.” The chairman said that that was maybe right but lots of the club did not take advantage of it and anyhow it was a good medium for recruiting. 4/9/58: Advertising for open races – Mr MacPhail said that this part of the business could be left to him. 30/11/58: Fund raising cards – Mr MacPhail to get them. 29/8/59: Re-nominated as club rep to the NCCU (with Jack Brown) and to the DAAA. 30/1/60: The chairman had now taken charge of the football cards from Mr J McMenamin who had a change of employment. Boghead was not available for training, Mr MacPhail agreed to write to the Education Department and to the Vale of Leven FC. 24/9/60: Open races: Mr MacPhail let it be known that he had notified local schools and also sent them a poster. 2/3/61: In a discussion about the handicap system used within the club, he offered to investigate how other clubs organised their handicaps. 15/9/62: Officials: Our chairman said that he had had a talk with Mr D McL Wright who was upset at the shortage of officials for various events and he asked Mr McPhail to try to get some of the club interested. After some discussion it was felt that we could not do too much as most of our lads were still active members. Mr MacPhail agreed that his name should be nominated. I have noted these particular items to indicate the range of things which he was asked to take on, and which he volunteered to take on, for the benefit of the club. Laying trails for races, attending meetings of governing bodies, providing prizes for races, organising the track season and applying for lets, writing to politicians and officials, investigating the handicap system, posters to schools, drawing up fixture lists and letting his name go forward for training as an official are all noted in the extracts quoted. Remember that these were in addition to his other interests of hill walking, mountaineering. writing, teaching, etc. Furthermore they were usually carried out by various other committee members – letters by the secretary, handicaps and trail laying by the captain, etc. Some of the club work took up considerable amounts of time and in addition to the committee attendances, he represented the club for a time at the SAAA and well as for many years being their man at the DAAA and the NCCU meetings. His commitment over the period was astonishing: it is normal for a new president/chairman to dive in and work really hard for a few years – but Doc was the same right through to the end of his 23 year stint as President. Mc MacPhail then read out a letter he had submitted to the Parks Committee via the Town Clerk asking them what they intended doing about a running track. He pointed out that he had a letter from a previous Town Clerk pledging his support, and although this had been a number of years ago, we still awaited action on this matter. He then went on to explain that neighbouring towns were better equipped and how some of the local athletes travelled there regularly to take advantage of the better facilities provided, and in some cases were lost to the club. He also reminded them that this state of affairs was prevailing all over the country, and was no doubt responsible for Scotland’s poor representation at the recent Olympic Games. And he followed this up with face-face-meetings with local officials and politicians. eg “5th March 1964: The Chairman has done a lot of research on this matter – the suggested locations had come down to 1. The Common; 2. St James’s Park; 3. Postie’s Park.” 1st September 1964 “we kept breathing down the neck of the council” August 1966: “track unlikely for the next two years.” 21/9/68: “The chairman explained the obstacles which had met the club’s proposals that the track should be sited on the Common.” Various other sites were suggested. It would be totally wrong to give him sole credit for the negotiations – such a big item for any athletics club has to be the work of the entire committee but what seems to come through from the Minutes is his efforts in investigating venues, writing and badgering those in positions of power and keeping it high on the agenda. Although he resigned at President in 1969 (the same year as he retired from teaching at Clydebank High School after 20 years there) he was working for the club for many years after that. 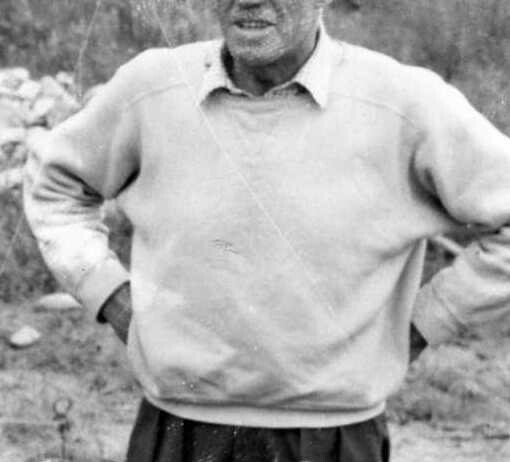 For instace, the minute of 18th April 1974 said “Point to Point: The run went off very successfully, largely due to Dr IMM Mac Phail who had laid a very well marked trail.” The trail was from the Whangie on the Stockiemuir Road, over the top of the Kilpatricks down into Dumbarton. Not bad for a man in his seventies. Doctor MacPhail was an energetic man who walked quickly with a lift in his step. He always looked at the person he was talking to and fairly often when he was explaining something to any athlete or to the committee he is reported to have asked, “Now, d’you follow me?” The energy seemed almost boundless and Dumbarton AAC and Scottish athletics possibly got more than its fair share.